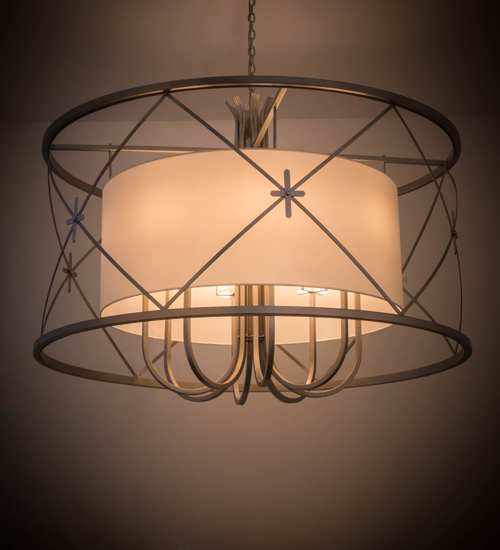 Description: American craftsmanship creates the beauty of fine lighting with this elegant Penelope pendant. A circular frame embraces a stunning White Linen Textrene shade that envelopes Fleshtone Idalight and conceals 8 customer-supplied A19 60-watt lamps. The decorative steel arms, along with the diamond and cross designed accents, are hand finished in a handsome Nickel powdercoat. The result is a unique pendant-in-a-pendant style. Custom sizes, designs and colors are available, as well as dimmable energy efficient lamping options such as LED. The fixture is UL and cUL listed for damp and dry locations.